The "cease-fire" in Syria is on shaky ground into Day two, with sporadic fighting, with most areas remaining calm. It appears, however, that Turkey is the largest "violator" of the cease fire, through its continued shelling of certain parts of Syria. Russia, just moments ago, at 5:15 PM eastern US time, "respectfully reminded" Turkey that both Russia and the US agreed "any party which does not abide the cease-fire will be added to the list of terrorist groups." Russia then "urged" Turkey to "mind its actions to avoid placing itself on that list!" Read between the lines, folks: It seems that what Russia is really saying is: knock it off, or we target YOU. After months of DENYING they are assisting Al-Qaida and other terrorists inside Syria, the government of Turkey has been caught red-handed doing exactly that! Subject: Provision of by providing regional interests of the Turkish Republic (TR) comprehensive support for the Mujahideen Dzhebhat al-Nusra, leading the fight in Syria against the strengthening of the positions of the Syrian Kurdish "Party of Democratic Union" and thus preventing the expansion of the separatist organization "PKK" in the framework following claims. Placement of the Mujahideen in the welfare facilities belonging to public institutions of your province (Hatay). Under the leadership of the National Intelligence Organization TP carried out to ensure the transition from the Mujahideen inside your province to Syria to fight against the separatist organization "PKK", leading its expansion due to the Syrian representative - "Party of Democratic Union." Among these Mujahideen, for the most part, are persons of Chechen and Tunisian nationalities related to the organization Jebhat al-Nusra and coming into our country from different countries. At the same time, the importance given to the issues of intelligence officers with the necessary support and assistance, with full provision of an adequate level of security and privacy. It seems appropriate to place the Mujahideen in guest houses, under the jurisdiction of the Ministry of TR religion, as well as in public Province hotels on the direct orders of the National Intelligence Organization TP. During the implementation of activities related to the implementation of this circular, you must pay particular attention to the privacy mode. Details and requirements suppose assume particular importance. This is now irrefutable proof that the government of Turkey has recruited, supplied and supported terrorists from the Al-Qaida affiliate "Al-Nusra Front" as part of an effort to forcibly overthrow the government of Syria. This is, in every aspect, and act of war by Turkey against Syria. The man under whose name this memo was issued, and who apparently signed it himself, is Foreign Minister Muammer Guler, pictured at left. This is no low level lackey; he was the Foreign Minister of Turkey! Hence, a state-sponsor of terrorists. If anyone in the United States government knew about this, and continued to do business with or provide support to the government of Turkey, then that member of the United States government has committed a felony violation of 18 USC 2339(b) "Providing material support to foreign terrorist organizations." The legal logic works like this: If Turkey paid money or used its public housing resources to house affiliates of Al-Qaida, then Al-Qaida did not have to use its own money to do so. Thus, Al-Qaida could use the money they would have spent for such housing. . . . on something else. Therein lies the material support of terrorism by this Minister and his country! We await seeing the Commander-In-Chief and some of his top Generals being given a "perp walk," in handcuffs, for providing "aid" to Turkey, thus allowing Turkey to "aid" Al Qaida, making the CIC and his generals who knew about this, criminals. We wonder if the Military Police will be able to find some "convening Authority" to file charges under the UCMJ to put a stop to our own country aiding Al-Qaida affiliated terrorists. Berlin has given Ankara a deadline of ten days to show good will by “significantly” reducing the influx of refugees and migrants across the Aegean Sea, otherwise Europe will no longer be able to avoid the closure of national borders in a row, that was said today in an analysis of the Paris newspaper “Le Figaro”. Ultimatum, which was set by the German Interior Minister Thomas de Maiziere, refers to both Ankara and Athens and the other capital cities which have not restrained wave of newcomers, and the time limit is not accidental, because it will be in exactly 10 days, at a summit of EU and Turkey, time to draw a balance of “pact” which has so far caused only disappointment on both sides, writes the French daily. German Chancellor’s is, as noted by French daily, under the pressure of the internal deadline, since in less than a week, on March 13, her Christian Democratic Union is threaten by loss, to the benefit of the extreme right-wing, in the three key regional elections, the first ballot since the beginning of the 10-month crisis in which Berlin found itself, and that for the ruling party could be an ” punishment “. “Until March 7th we want to note a significant decline in the number of refugees at the Turkish-Greek border,” Thomas de Maiziere said, adding that if this does not happen, Europe needs to take additional measures. This message, however, several diplomats interpreted as a “catastrophic scenario”, in which Berlin drastically reduces the number of refugees that will be received, after he strongly urged them to come last year. In that case, the border across Europe would be closed, in a chain reaction, which for Schengen, could be a sign that this zone came to an end, as it was said by the unnamed ambassador. Austria, with its precautionary measures, showed how this might look, while Greece, where disembark almost a million newcomers for a past year, could soon become their final destination, concludes “Le Figaro” as quoted by Tanjug. A Russian TV crew has managed to obtain video proof of Turkey’s increased military presence on the Syrian border, as it filmed fortifications and tanks on the frontier. The lodgments are heavily fortified by tanks and self-propelled guns, REN-TV crew reported from the scene. Shells and other ammunition are being delivered to the Turkish positions, which are shelling Kurdish forces in Syrian territory, according to the report. “The barrels of the tanks and self-propelled guns are pointed in the direction of the mainly Kurdish Syrian city of Kobane,” the journalist said. There were at least six or seven tanks in the area and the Turkish forces on the border can be deployed in Syria“in an instant,” according to REN-TV. Meanwhile, the area appeared to be very active, as Turkey continued to transport various supplies to the border. The REN-TV journalists spoke to the mostly Kurdish locals, who openly accused Turkey of being “friends” with the Islamic State fighters that had earlier raided nearby houses. The extremist fighters took the most expensive things from the homes, including “money and jewelry,” they said. The residents also provided evidence proving that various military crimes had taken place and described how Turkey and Islamic State forces had opened fire on locals trying to flee the area – and then stolen their car. “There were 30 cars moving towards the border when Turkish military and Daesh fighters opened fire on the vehicles, a lot of them caught fire. Terrorists ended up taking the vehicles that could still drive,” resident Beker Ramadon told REN-TV. Moreover, in the city of Jarabulus, which is located in the north of Syria near the Turkish border, residents told the journalists that local houses are being destroyed by Turkish tanks. “Turkish tanks fired at and destroyed a house five days ago,” a Kurdish fighter said, pointing to the rubble. The REN-TV reporters tried to determine where the fire had come from and noticed a couple of hidden tanks in the pictures they had taken from the crime scene. During the first night of the Syrian ceasefire, more than 200 Islamic State fighters crossed the Turkish border into Syria and another 100 came up from the Syrian city of Raqqa before joining forces near Kurdistan, the Russian center for reconciliation said in a report. The journalists said the fighting had intensified quickly after that, adding that if not for the brave efforts of the Kurdish forces in Syria, the city could have been easily overrun by the terrorists. There have also been reports of a heavy artillery attack on the Kurdish town of Tel Abyad in northern Syria near Kurdistan. However, Turkish military sources denied to Hurriyet that its forces had been involved in any cross-border shelling. The much-anticipated Syrian ceasefire was brokered by leading world powers, including the US and Russia. It aims to pave the way to reconciliation between the Syrian government and “moderate” rebel forces, which would together agree on a peaceful political transition for the country. The terrorist groups in Syria, such as Islamic State and Nusra Front, are excluded from the ceasefire, which took effect at midnight on February 27. In an interview earlier this week, Turkey’s Prime Minister, Ahmet Davutoglu denied that Turkey had any intent to invade Syria. According to the PM, it was unlikely that such a move would be supported by its Arab allies, which have already criticized Ankara for sending troops into northern Iraq. In an Al-Jazeera interview this week, Davutoglu also admitted that Ankara was, in fact, supporting armed groups in Syria. “How would they be able to defend themselves if there was no Turkish support for the Syrian people? ... If there’s a real moderate Syrian opposition today, it’s because of Turkish support. If the [Assad] regime isn’t able to control all the territories today, [it’s] because of Turkish and some other countries’ support,” he said. "It is pretty obvious. 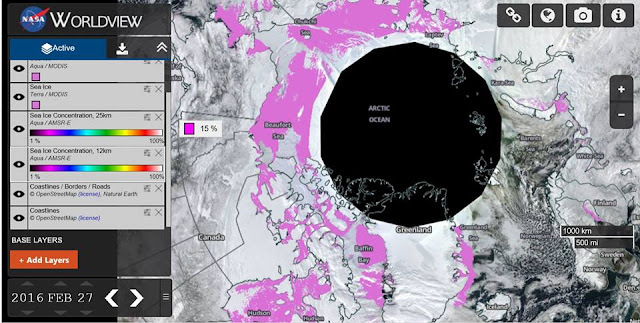 We are running out of time faster and faster as the 5 year deadline approaches for the subsea Arctic atmospheric methane blowout and terminal firestorm." 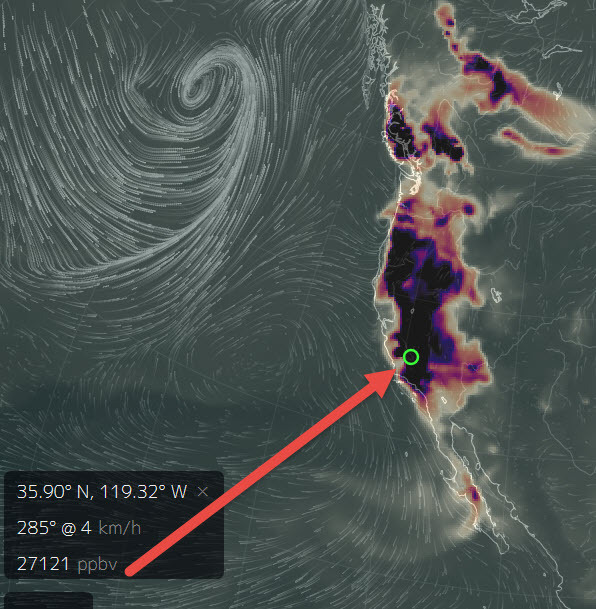 Carbon Monoxide Spikes to 40,000 Parts Per Billion over California on February 26 — What the Heck is Going On? 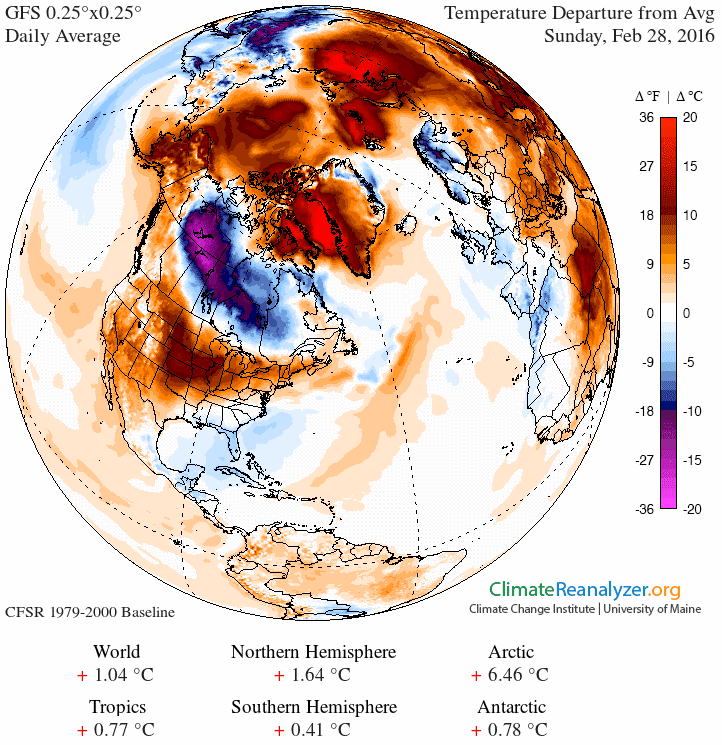 On February 26, The Global Forecast System model recorded an intense and wide-ranging carbon monoxide (CO) spike over the US West Coast. 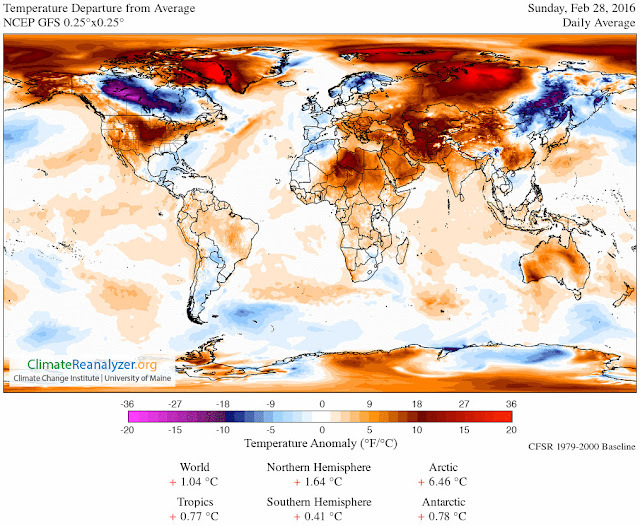 A region stretching from British Columbia, through Washington and Oregon, and on over most of California experienced CO readings ranging from about 5,000 parts per billion over the mountains of Southwestern Canada to as high as 40,000 parts per billion over Southern California. Very high peak readings appear to have occurred from Northern California near Eureka and the southern edge of the Cascadia Subduction Zone and along a line south and eastward over much of Central California to an extreme peak zone just north and west of Los Angeles near Palmdale along the San Andreas Fault Line. For reference, these readings were between 50 and 265 times above typical background CO levels of about 150 parts per billion and up to twelve times higher than secnd highest peak readings over polluted regions of China during the same period.Human-based carbon monoxide sources are not generally known to produce spike readings so high and so wide-ranging. 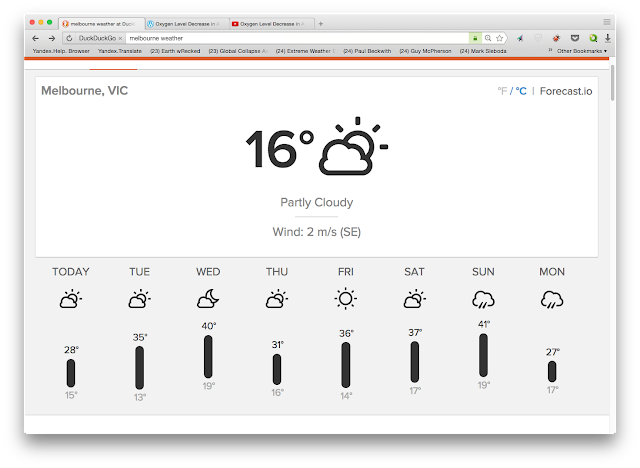 Nor are wildfires (of which there were no reports for this region). The primary suspect for this preliminary observation, therefore, is geological. 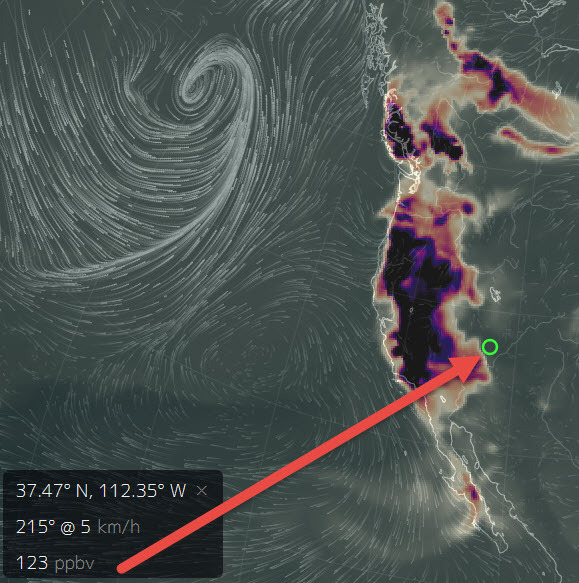 As the spike occurs over large fault lines, volcanoes, and above other active geological features along the US and Canadian West, it appears that activity within these features may have produced a brief if intense burp of this gas. Sulfur dioxide (SO2) readings — another geological gas — were also elevated, with peak readings again appearing in Southwestern California. It’s worth noting that no major US or Canadian geological organization has yet made any report on this particularly large CO spike. However, a piece of scientific research in Nature Asia, by K. S. Jayaraman notes that major CO and SO2 spikes may be an indication that future earthquake activity is on the way. Analysis of the satellite data showed a large peak in CO concentrations during January 19 and 20 — a week before the main earthquake event.On January 19, the total CO in the vertical column was also higher than usual. After the 26 January earthquake the concentration of the gas dropped. This particular bit of research appears to have had no confirmation or further comment in the sciences at this time. So the predictive usefulness of large CO spikes prior to earthquakes remains quite uncertain. And, as noted above, no major geological information outlet has made any warning or comment on earthquake risk so far. Thus the current very large West Coast CO spike near major fault lines remains a bit of a mystery. "Unprecedented" and "dangerous" levels of Carbon Monoxide are being released into the atmosphere from seismic faults. The levels are so bad, they're dangerous! 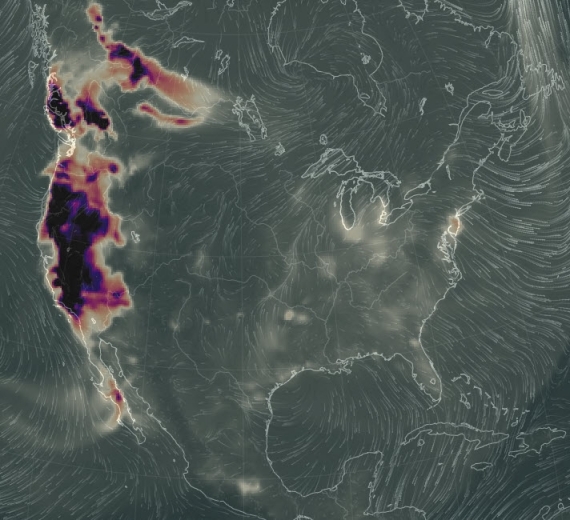 People on the West coast may find they are having trouble breathing and feel strangely tired. Some folks may notice the surface of their skin taking on a bright red appearance; the signs of Carbon Monoxide poisoning. Scientists are working feverishly to try to determine the cause, but, they say a consensus is quickly developing: The earth itself is emitting this gas and it is being released into the atmosphere via seismic fault lines; cracks in the earth's surface where tectonic plates rub together. If levels continue to rise as they presently are, people could be overcome, pass out and die from this. As of 11:00 PM eastern US time on 27 February, 2016, there is no other place on the entire planet with Carbon Monoxide levels this bad or this widespread. It is completely unprecedented! To give you an indication of how rare and how severe this is, take a look at the screen shots below. In this location, surface level Carbon Monoxide is 27,121 in an area where the "usual" level is around 150.! It is important to emphasize this "bloom" of Carbon Monoxide is not man-made. It is not possible for human activity to cause this type of staggering increase over such an enormous area. It is almost like the planet itself is attacking the people out there; even though it would be absurd to think the planet would "attack" anyone. Why such an emission of deadly Carbon Monoxide would suddenly spew forth from inside the earth is unknown at this time. But it is clear on its face, that in order for this to be taking place, something changed underground on a continental scale. Something moved or cracked along the entire west coast of North America. That is the ONLY logical explanation for this event. What it means for the future we just don't know. Earth emits a burst of carbon monoxide (CO) a few days before an earthquake, according to geophysicist Ramesh Singh, pictured left. He and co-workers from France and the United States report that this gas could be used as one of the precursor signals for an earthquake early warning system. The scientists used data from an American satellite and analyzed changes in carbon monoxide at different altitudes. "The carbon monoxide shows enhancement in concentration a few days prior to the earthquake," Singh said. The researchers discovered the connection between CO emission and earthquake by analyzing satellite remote sensing data collected around the time when a 7.6 magnitude earthquake shook Gujarat in western India nine years ago killing about 20,000 people and rendering thousands homeless. According to the scientists, CO gas is forced out of the earth due to the build up of stress prior to the earthquake "influencing the hydrological regime around the epicenter." Light is returning to the Arctic. 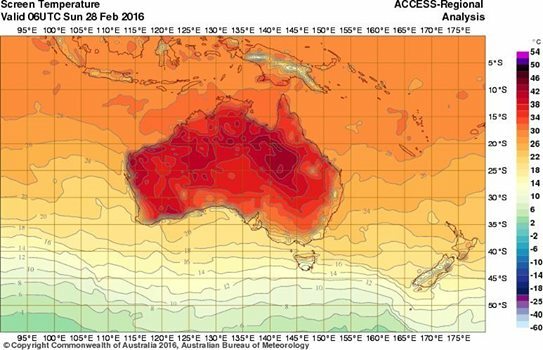 "Australia seems like the hottest place on earth at the moment, even hotter than the equator. 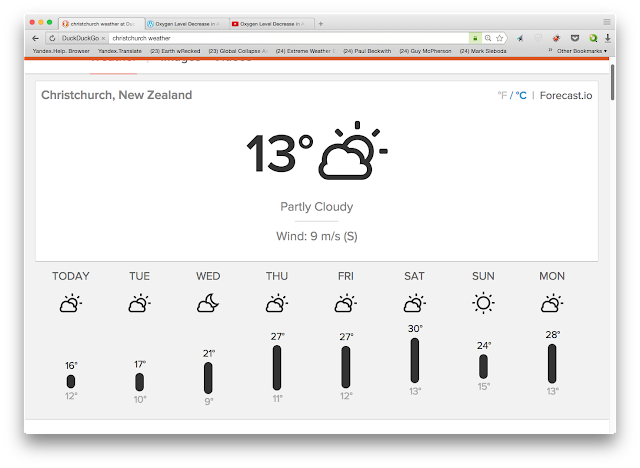 We are being cooked in the out of control climate change"
Across the Tasman, in Christchurch we have some cool temperatures but the Melbourne weather will catch up a couple of days later. 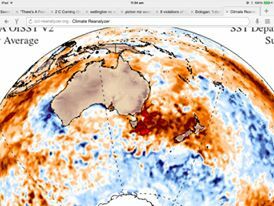 Meanwhile, we continue to have very warm temperatures in the Tasman Sea, between Australia and New Zealand. Conditions globally (temerature anomalies). 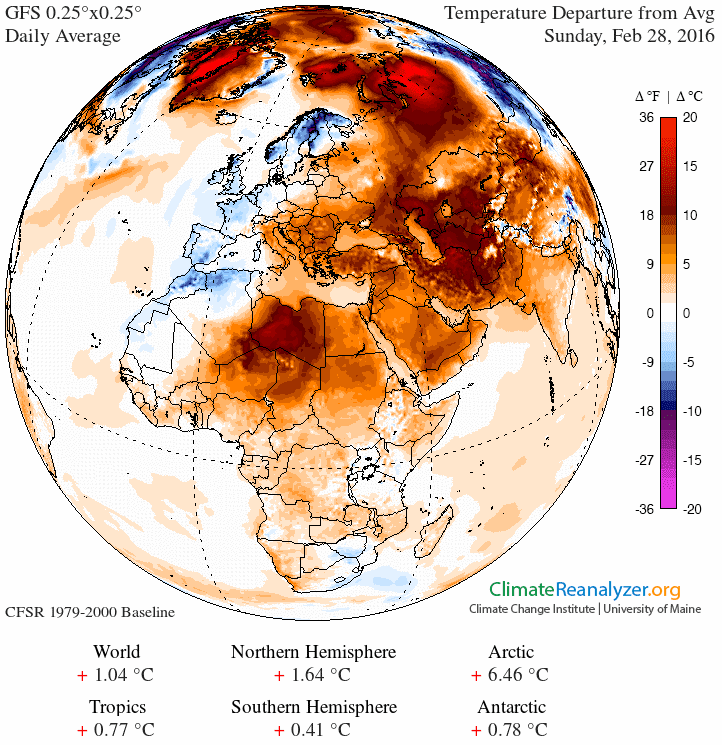 There's a lot of heat around on the planet. The North Pole is (relatively) on fire. Combustion of fossil fuels causes oxygen to decrease in the atmosphere/ocean system. As does deforestation, exponential population growth and phytoplankton loss in the oceans from warming stratification limiting nutrients at the surface. It is often said that the oxygen in every second breath you take is produced by photo plankton, that are the true lungs of the planet. I discuss the extend of the oxygen decrease, which is more than you want to know. Please visit my website paulbeckwith.net and help support my videos/research (self-funded) via the Please Donate tab. Just as the worst methane leak in California’s history is sealed and the U.S. Environmental Protection Agency (EPA) acknowledged that America pollutes much more methane than previously estimated, Earthworks—the group that filmed the videos revealing the scope of the methane disaster in Los Angeles County—released a map of 180+ infrared videos of oil and gas methane pollution events across the country. 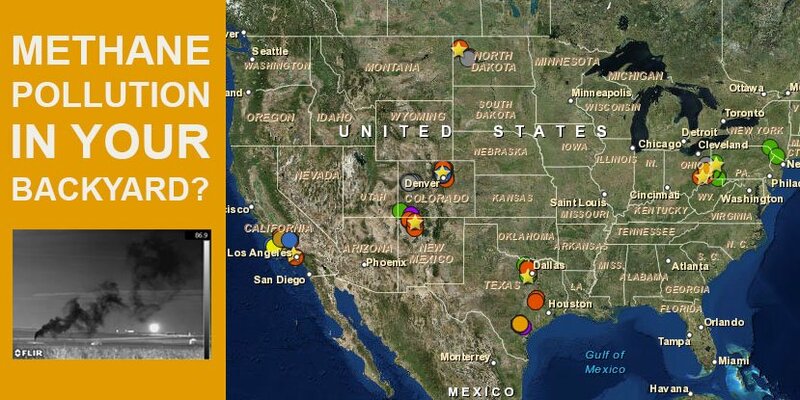 The map, created with the help of FracTracker Alliance, includes two new videos that epitomize the national methane pollution problem. “In November of 2012, the voters in Longmont banned fracking to protect our health, safety and wellbeing, especially because of air pollution,” said Kaye Fissinger, president of Our Longmont. With more being added every month, the 180+ infrared videos—filmed starting in September 2014—expose otherwise invisible air pollution from oil and gas development. 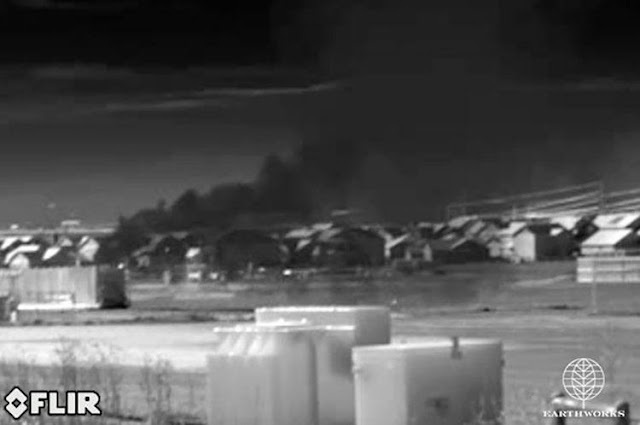 Earthworks uses a FLIR(Forward Looking InfraRed) GasFinder 320 camera that is specially calibrated to detect approximately 20 pollutants associated with oil and gas development including methane (a climate pollutant more than 80 times as powerful as carbon dioxide over 20 years), benzene (a known carcinogen) and other volatile organic compounds (VOCs). Earthworks ITC-certified thermographers have documented air pollution from wells, compressor stations, transmission infrastructure and storage facilities. The map comes on the heels of the Bureau of Land Management’s proposal to cut methane pollution from oil and gas development on public lands from new and existing sources. Late last year the U.S. EPA proposed rules to cut methane pollution from new and modified oil and gas facilities. If the EPA does not begin a new rulemaking to address existing sources of air pollution, communities living next to this invisible oil and gas pollution will be left to breathe dirty air. 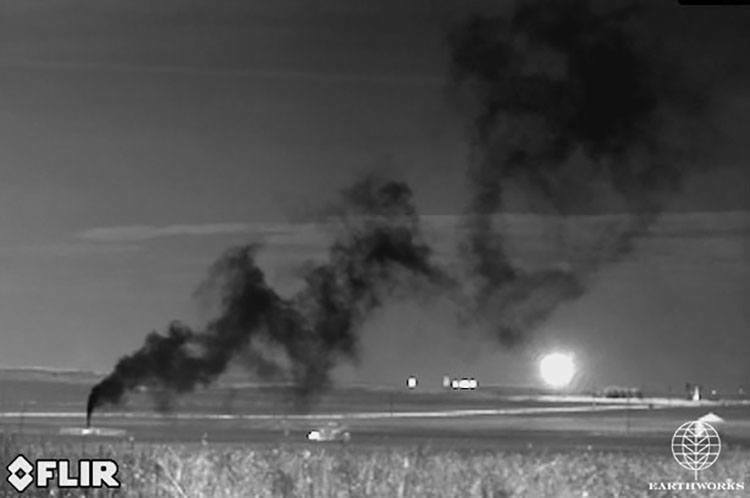 Earlier this week in a draft, the EPA revised its estimate of U.S. oil and gas methane pollution upward by more than 25 percent. Russian generals killed by US missiles?